Director – Brian Trenchard-Smith, Screenplay – Jon George & Neil Hicks, Story – David Lawrence, George Schenck & Robert Williams, Producers – William Fayman & Antony I. Ginnane, Photography – John McLean, Music – Brian May, Special Effects – John Stears, Makeup Effects – Bob McCarron, Production Design – Bernard Hides. Production Company – Filmco/Hemdale/FGH. The year 1995. The latest group of ‘social deviants’ arrive at a prison camp where they have been sentenced for rehabilitation. The arrivals include Paul Landers who ran a pirate radio station; Chris Walters, a pacifist who protested against the brutal treatment of a fugitive she aided; and Rita Daniels who is accused of prostitution. They find life inside the camp among the guards and other inmates to be brutal and cruel. Four prisoners are then offered the chance of winning their freedom in the annual Hunt if they can evade armed pursuers for twenty-four hours. Turkey Shoot was one of the first Australian films to copy the enormous international success of its countryman efforts Mad Max (1979) and Mad Max 2 (1981). Turkey Shoot appropriates both the brutal, darkly nihilistic tone of Mad Max, as well as the colourfully comic-bookish tone of the sequel. 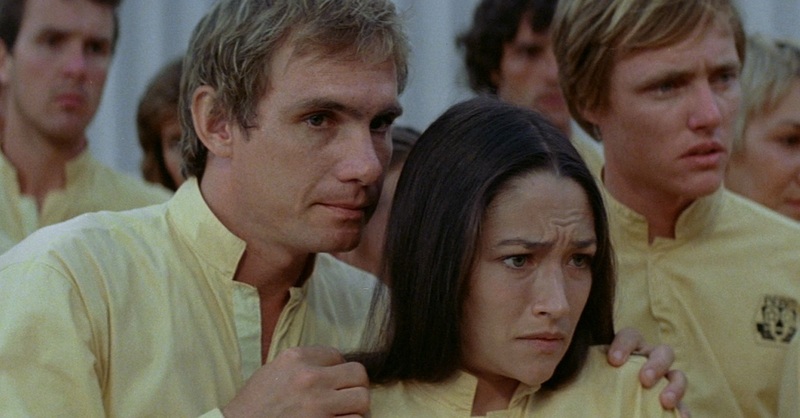 You can perhaps also detect the influence of the then recent Escape from New York (1981), which begat the surprisingly popular subgenre of the futuristic prison movie. That said, the real source of Turkey Shoot is actually the oft-filmed The Most Dangerous Game (1932) about an ordinary man being made to rely on his wits and bare hands as he defends himself against a hunter who regards the pursuit of people as a sport, and even more so Peter Watkins’ Punishment Park (1971) about a totalitarian near-future where a group of prisoners are given the chance to earn their freedom if they can make it across a desert and avoid armed hunters. However, any serious political message that Turkey Shoot might aspire to present is completely offset by the campy overacting of the pursuing hunters and an often incongruously tongue-in-cheek approach. The prison film/totalitarian future background is only an excuse for a gore film and director Brian Trenchard-Smith takes great delight in serving up machetes in heads, sundry hands and toes chopped and bitten off, torso decapitation by bulldozer blade, rapes, people being burned alive and the intriguing effect of seeing one victim torn in half by machine-gun fire. (This high gore content had Turkey Shoot cut considerably in almost all international releases). The sum total of political commentary runs to naming the camp’s totalitarian commandant Thatcher. (There is debate about whether this was intentional or not but the satire did not go amiss in England where the film was retitled Blood Camp Thatcher). Brian Trenchard-Smith directs at a slow-moving pace – the gore does not come snappy enough to be entertaining the way it is in say The Evil Dead (1981) or Re-Animator (1985). Characters run to predictable one-dimensional arcs for this genre. A much better gorily over-the-top futuristic prison film was the Hong Kong effort Story of Ricky (1991). A poll once named Turkey Shoot the worst Australian film ever made. There is reasonable discussion of Turkey Shoot in the documentary Not Quite Hollywood: The Wild, Untold Story of Ozploitation! (2008). Apparently the budget was cut, while Steve Railsback makes claims the producers spent all the time at the racetrack (it is not clear whether they were spending budget money or trying to win enough to finish the film). It is said that Brian Trenchard-Smith responded to this but piling on gore and a campy approach. Much disparagement is poured on the film, even claims that real bullets were shot at actors on set. The film was later badly remade as Turkey Shoot (2014) with Antony I. Ginnane and Brian Trenchard-Smith serving as executive producers. There the concept was turned into a reality tv show. 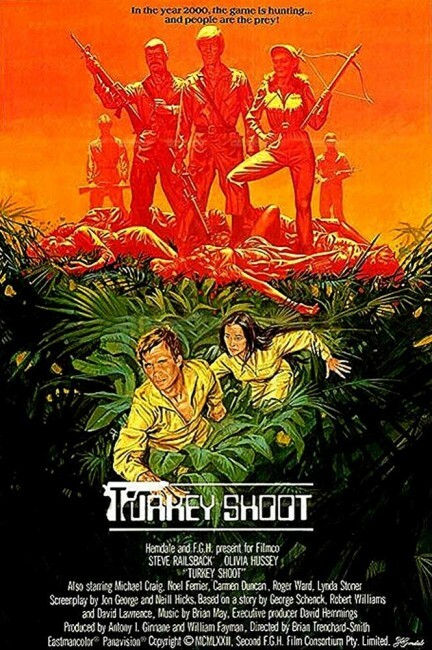 Turkey Shoot was the first genre film from Australian director Brian Trenchard-Smith who had previously made a number of action entries in the Australian exploitation genre, most notably the popular The Man from Hong Kong (1975). In between the likes of BMX Bandits (1983) and episodes of Australian-shot US tv series like Mission: Impossible, Time Trax and Flipper, Trenchard-Smith went onto make two quite good films, the sharp and witty Dead-End Drive-In (1986), another (much better) future prison movie about youth being corralled into a prison disguised as a drive-in theatre that is everything that Turkey Shoot should have been, and the worthwhile Aboriginal children’s ghost story Frog Dreaming/The Quest (1986), as well as the purportedly terrible astral horror Out of the Body (1989). Trenchard-Smith subsequently moved to the US where he has been occupied in making some excruciatingly bad tongue-in-cheek horror films – Night of the Demons 2 (1994), Leprechaun 3 (1995), Leprechaun 4: Leprechaun in Space (1996) – as well as the Christian End of the World film Megiddo (2001), the monster movie Tyrranosaurus Azteca (2007) and various tv movies including the alien abduction film Official Denial (1994), the meteor collision film Doomsday Rock (1997), Atomic Dog (1998) about a mutant dog, the haunted house film Sightings: Heartland Ghost (2002), the plague film The Paradise Virus (2003) and Arctic Blast (2010) about a new Ice Age. Trenchard-Smith has also produced the monster movie Blood Tide (1982), Demonstone (1990) and Malibu Shark Attack (2009).